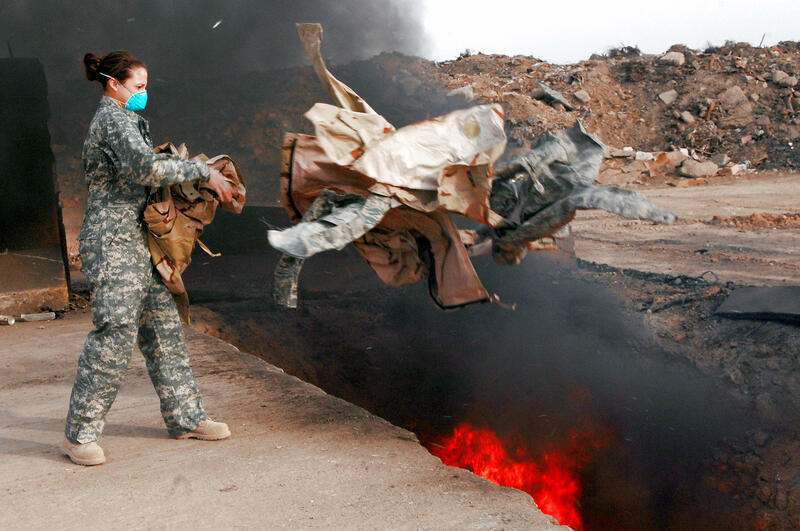 Senior Airman Frances Gavalis tosses unserviceable uniform items into a burn pit at Balad Air Base, Iraq in 2008. The military destroyed uniforms, equipment and other materials in huge burn pits in Iraq and Afghanistan. Some veterans say those pits are responsible for respiratory problems they are now experiencing. "I was able to catch up, but afterwards, my goodness, I remember just — I laid on the ground, I was so exhausted," Torres says. "One of my buddies said, 'Man, what's wrong?' I said, 'Man, I don't know. I just feel really, really tired — my chest feels really tight. I don't know.' I couldn't catch my breath." A few years later, Torres was diagnosed with a rare disease called constrictive bronchiolitis. Scars in his lungs block the flow of air. He's among a growing number of veterans from Iraq and Afghanistan who believe their respiratory ailments are linked to burn pits. These were acres-wide mounds of waste near bases that contained everything from batteries to vehicle scraps to amputated body parts. The refuse was usually ignited with jet fuel. "What people don't understand is just how large some of these bases really are — I mean, they're small cities," Patricia Kime tells NPR's David Greene. She's a health care and medicine reporter for Military Times. She says soldiers reported seeing dark plumes of smoke hanging heavy in the air. "So these are open-air pits where they would light it on fire, and quite often they ran 24 hours a day," she says. One challenge for veterans is proving that burn pits are really the cause of their illnesses. "People have said that it's this toxic mix of tiny, tiny dust particles that are not related to the burn pits, that are just related to the soil and the air in Iraq and Afghanistan, and often has contaminants in it such as aluminum and iron and titanium — so, heavy metals," Kime says. "The burn pits are the most obvious visual reason to blame, but it could be the dust, it could be chemical exposures, there could be a lot of other issues going on." Last year, Congress ordered the Department of Veterans Affairs to set up the Airborne Hazards and Open Burn Pit Registry. So far, almost 50,000 veterans have signed up. "It's not just necessarily burn pits. If you feel like you're sick as a result of deployment, you can sign on to it," Kime says. "And it's supposed to be used to track and to try to get some handle on the extent of the illnesses among this cadre." "At this time, there is conflicting and insufficient research to show that long-term health problems have resulted from burn pit exposure. VA continues to study the health of exposed veterans. The burn pit registry, which helps participants to become more aware of their health, while helping researchers to study the health effects of burn pits and other airborne hazards, is one of several research projects currently underway at VA."
And there's something else at stake here. One of the companies that operated the burn pits, KBR Inc., is facing lawsuits from veterans across the country. The company says if it's held liable, the U.S. military will have a hard time finding companies to do this kind of work. "They believe that in future wars, these jobs will be done by contractors, and if they are not protected, it will be impossible for America to go into another war," Kime says. "At the limited number of bases where KBR operated burn pits in Iraq and Afghanistan, KBR personnel did so safely and effectively at the direction and under the control of the U.S. military. "Government studies and reports show that military personnel deployed to Southwest Asia were exposed to many hazardous conditions, including the harsh ambient air. The government's best scientific and expert opinions have repeatedly concluded there is no link between any long term health issues and burn pit emissions." But Capt. Torres disagrees. He and his wife, Rosie, founded Burn Pits 360 — a group that connects veterans who blame their chronic ailments on the practice. "There's no doubt at all," he says. "I know this has been the result from the environmental exposure. There's no doubt." Editor's Note: The original photo on this story appeared to be manipulated and rendered part of the scene in black and white. When this was brought to our attention, we replaced it with a different version of the same photo that more accurately reflects the scene. We turn now to a story of some U.S. veterans battling a certain fog of war. One of them is Army Reserve Captain LeRoy Torres. In 2008, he returned home to Robstown, Texas, after a year-long tour in Iraq. He went back to work as a state trooper with the Texas Highway Patrol. Torres was an athlete - longtime runner - and so when a suspect fled one morning, he went sprinting after him. But then suddenly he felt this burning in his chest. It got so bad it almost knocked him down. LEROY TORRES: I was able to catch up, but afterwards, my goodness. I remember just - I laid on the ground. I was so exhausted. And my buddy said, man, what's wrong? And I said, man, I don't know, I just feel really, really tired and my chest feels really tight. I don't know, I just - I couldn't catch my breath. GREENE: After a lot of medical testing, Torres, at age 39, was diagnosed with a rare disease called constrictive bronchiolitis. Scars in his lungs are blocking the flow of air. He is among a number of growing veterans from Iraq and Afghanistan who believe their respiratory ailments are linked to what are known as burn pits. These were acres-wide mounds of waste near military bases that contained everything from batteries to vehicle scraps to amputated body parts. PATRICIA KIME: What people don't understand is just how large some of these bases really are. I mean, they're small cities. So these are open-air pits where they would light it on fire. And quite often, they ran 24 hours a day. GREENE: That is Patricia Kime. She's been writing about this for the publication Military Times. And she says one challenge for veterans like Torres is proving that these burn pits are really the cause of their illnesses. KIME: People have said that it's this toxic mix of tiny, tiny dust particles that are not related to the burn pits - that are just related to the soil and the air in Iraq and Afghanistan - and often has contaminants in it, such as aluminum and iron and titanium - so heavy metals. So the burn pits are the most obvious visual reason to blame, but it could be the dust. It could be chemical exposures. There could be a lot of other issues going on. GREENE: Last year, Congress ordered the Department of Veterans Affairs to set up the Airborne Hazards and Open Burn Pit Registry. And so far, almost 50,000 veterans have signed up. KIME: It's not just necessarily burn pits. If you feel like you're sick as a result of deployment, you can sign onto it. And it's supposed to be used to track and to try to get some handle on the extent of the illnesses among this cadre. GREENE: If there is a clear link made between these burn pits and a lot of these medical conditions, how significant would that be? I mean, what's at stake here? KIME: If it were turned out to be the burn pits, you know, clearly were linked to these illnesses, it would be unusual because it hasn't happened in these past wars - except Agent Orange is clearly, now, linked to many cancers, and the VA admits that. But it would be very helpful for these veterans because then they could clearly get the medical care they need, and they would get compensation without having to petition VA for disability claims and then have to deal with the process of denials and re-petitioning. GREENE: Now, there's something else at stake here. One of the companies that operated the burn pits, KBR, is facing lawsuits from veterans across the country. The company that says that if they are held liable, the U.S. military is going to find it hard to find companies to do this kind of work. KIME: They believe that in future wars, these jobs will continue to be done by contractors. And if contractors are not protected, it will be impossible for America to go into another war. GREENE: That is Patricia Kime. She covers health and medicine for the publication Military Times. Now, we should add - KBR sent us a statement saying their personnel operated burn pits, quote, "safely and effectively at the direction and under the control of the U.S. military." The Department of Veterans Affairs tells us that so far, research into a possible link has been, quote, "conflicting and insufficient." Transcript provided by NPR, Copyright NPR.